"Ideas are the greatest and most crucially practical power on earth," wrote Ayn Rand. In the title essay of this collection, Leonard Peikoff applies this principle to the world of business. He shows that certain philosophic ideas, such as reason, egoism, and individualism, are needed to defend and protect the freedom of businessmen, while the opposite ideas, such as mysticism, altruism, and collectivism (which dominate our universities), destroy that freedom. Other essays in this volume will help businessmen understand the crucial role of philosophy in free trade, free markets, health care, and business ethics. ©1999 The Ayn Rand Institute (P)1999 Blackstone Audio, Inc.
A great and practical philosophical framework for everyday life . Dispels wrong notions that society has about money . 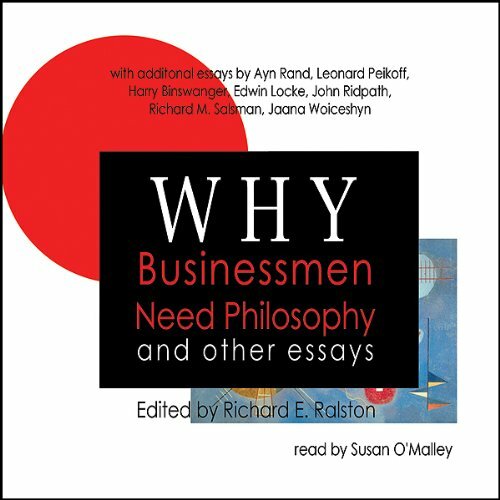 Where does Why Businessmen Need Philosophy and Other Essays rank among all the audiobooks you’ve listened to so far? It ranks at about 65% level, which is good. What about Susan O’Malley’s performance did you like? Vicious and zealous defense of the businessman, free enterprise and free markets. This collection of essays is fantastic! If you own / run a business this is a must-listen - not because you will get additional 'business skills' but because it puts the perception of business - particularly successful business into perspective. As with all 'tell it like it is' polemic on 'politically correct' drivel, 'attitude of entitlement' delusion, and 'creed of envy' socialist loser thinking, this audio book will offend those who need offense to expand their narrow mindset, and delight those who firmly believe in capitalism, individualism and 'making it happen' for themselves.